Keld Ampworks is a guitar amplifier repair service repairing audio electronic equipment in Newark (near Nottingham). I provide a fast and friendly service that is competitively priced. Please have a look around, I’ve repaired amplifiers by all of the main manufacturers (Fender, Marshall, Vox, Peavey, Laney, Mesa Boogie) and kept my customers’ boutique and unusual designs (Cornford, Carvin, Dr Z) in top condition. Most of the amps that I fix are valve amplifier repairs, but I do see plenty of solid state amplifiers too. I’m happy to work on modern amplifiers like Line 6 and Hughes and Kettner, but equally comfortable restoring vintage amps. Besides guitar amps, I also repair bass amps, PA equipment, DJ, speakers, HiFi. I’m pleased to say that I’ve had many happy customers – if you’d like to check out some reviews of my service, please visit the feedback page (pun intended!). If your beloved guitar amplifier or bass amplifier is in need of repair, servicing, upgrading or modifying, then please do get in touch to discuss your needs. Keld Ampworks Guitar amp repair was established in 2010 and moved to Newark (Nottingham) in 2012. Before Keld I studied with the Maughan Amplifier Company, a well-respected guitar amplifier repair and manufacturer in the North of England. I gained extensive experience of amp servicing in this position and during my time doing repairs and sales for Gear4Music. 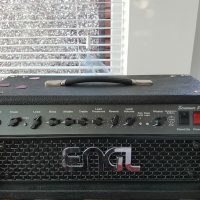 Although guitar amps are relatively simple, when repairing gear it’s important to have a thorough understanding of the theoretical as well as the practical and for this reason I completed a Masters in Electronic Engineering from the University of York. As well as the repair and design of guitar and bass amplifiers, I currently work as a development engineer designing amplifiers for a world-leading audio engineering company. As an active musician, playing in a range of different bands, I really do understand how crucial it is to have your gear in top condition! Why are valve amps louder than solid state amps?